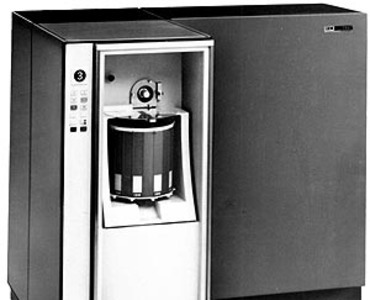 Known as the MARS file through much of its seven-year development, the IBM 2321 Data Cell Drive was a random access device that could store up to 400 million alphanumeric characters or up to 800 million decimal digits. 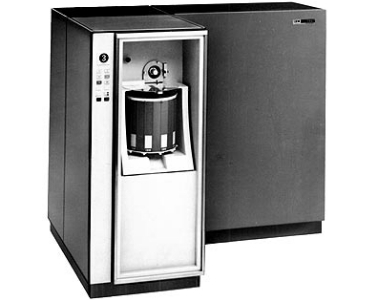 Multiple drives, providing a storage capacity of billions of characters of information, could be linked to the IBM System/360 (which was announced at the same time as the 2321). The MARS file had been conceived as a way to provide online storage for large data volumes at lower costs than disk storage. The 2321's eight data cell drives, with up to 6.4 billion digits, could be linked to one control unit. Additional files could be linked to other control units in the same system. Each drive was designed so that data cells were removable and interchangeable in increments of 40 million characters or up to 80 million digits. Information was stored on and removed from magnetic strips, which were held in cells mounted vertically around a rotating cylinder. To retrieve or write information, the data cell drive's positioning system rotated the cell cylinder to locate the specific 10-strip group needed and placed it beneath an access station. At the station, the particular strip was moved past a read/write head for transfer of data to the computer, and the strip then was returned to its original location. This process required approximately 450 milliseconds. Each group of 200 strips, or 40 million characters, was called a data cell and could be removed and replaced by another group. This was especially useful when records, such as insurance policies, were being updated. In fact, one of the first 2321 shipments was with a System/360 Model 40 to the Allstate Insurance Company in September 1965. The magnetic tape strips used for storing information measured 2 ¼ inches wide by 13 inches long by 0.005 inch thick. One side had an iron oxide coating for magnetic recording and the other side had an antistatic coating of carbon. Each strip had an individual coding tab, identifying its position among the 200 strips in a data cell. A handle cover, which protected strips from contamination during handling, was available for removing data cells. One data cell could be removed and replaced by another in less than 30 seconds. The 2321 had a five-position, 20-track read/write head. Each strip had 100 addressable recording tracks providing storage of approximately 200,000 (eight-bit) characters of information. Recording was accomplished in serial fashion at a strip velocity of 250 inches per second, which produced an information transfer rate of about 54,700 characters per second. Access time varied from 95 milliseconds to 600 milliseconds, depending on the addressed strip position and data arrangement in each data cell. Access time was the time required to position the mechanism to read a strip, which included locating the strip on the drum, reading, writing and write-checking it. There was no follow-on product for the 2321, probably because of rapid advancements in disk drive technology.